For fundamentalist Protestants, one of the most horrifying (if not the most horrifying) seasons of the year in Catholic Philippines is Lent. Christmas they can live with as there is nothing excessively idolatrous or fanatically superstitious in our Christmas celebrations. But Lent in the Philippines revolts every thinking Protestant fundamentalist who believes in salvation by faith alone, without any kind of human contribution by way of good-works or sacrifice and penance. 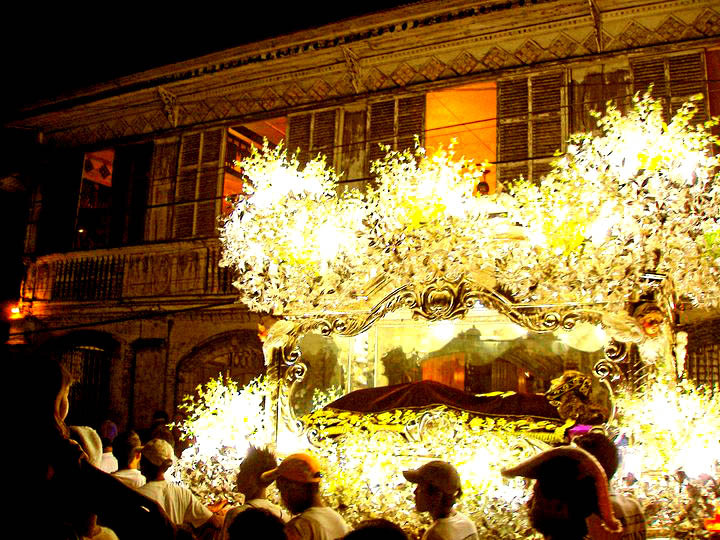 Lent in Catholic Philippines is very colorful and festive, but its essence is sacrifice and penance. Although more and more are going on vacations to beaches and mountain resorts during Holy Week, for the average Filipino, the right thing to do during Holy Thursday and Good Friday (even if that isn't what he does) is to fast and/or abstain and despite the heat (which is always worse during these two days than other days), mix with the huge crowds at traditional lenten activies in church or in the streets. 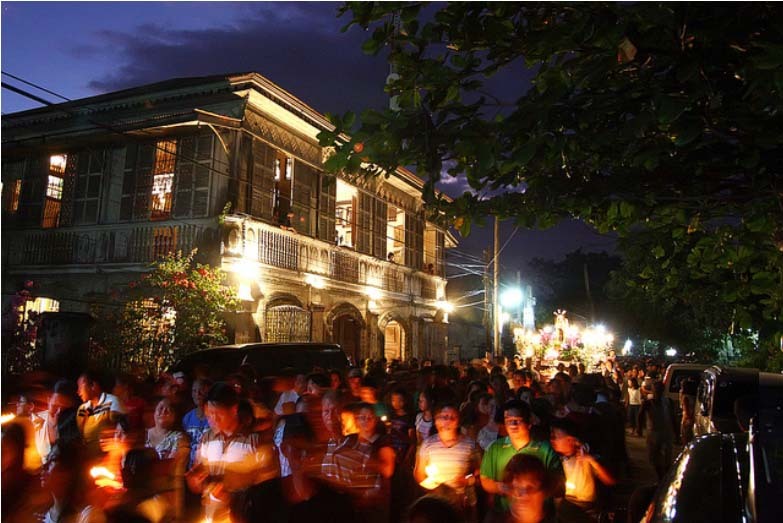 Holy Thursday and Good Friday processions are the rule everywhere. 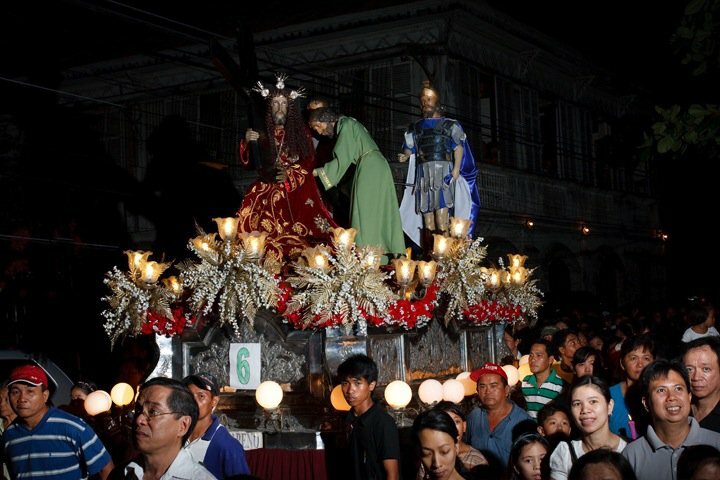 In some places, these processions are the only times when members of snobbish old-rich families can be seen on the public streets, dutifully, and with an effort at solemnity, walking behind or beside heirloom carosas and statues of saints and other characters involved in the passion narrative. Plazas are always crowded during procession days, so are cathedrals and churches where life-size images of Christ on the cross and the Santo Entiero draw devotees and penitents who clamber over these images in an effort to embrace, kiss, or wipe handkerchiefs and other things on these representations of Christ. Earlier in the day, there would have been community stations of the cross up mountains or through long distances, also street re-enactments of the passion and death of Christ. In many parts of the country, flagellants and people who actually have themselves nailed to wooden crosses give a very literal interpretation to the Lenten call to sacrifice. After the Holy Thursday mass, there is also the "Bisita Iglesia," visits to the blessed sacrament in at least 7 churches as a way of keeping awake with Jesus during the hours of his passion. 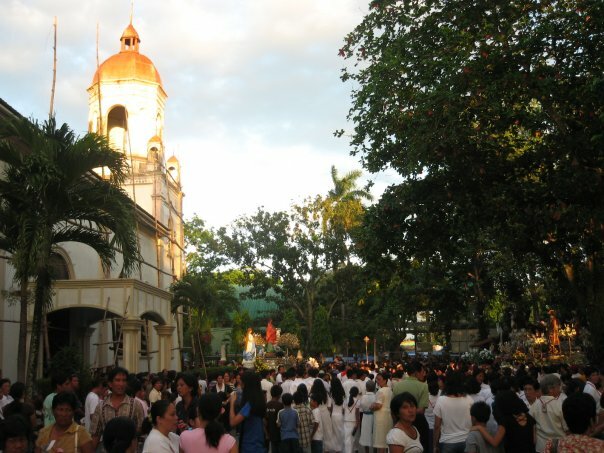 Before Holy Week, the masses for Ash Wednesday are also well attended, and one can't be a good Catholic unless he or she has had ashes imposed on the forehead on this day. Other popular Lenten practices include Palm Sunday palms that are shaped into many different religious and non-religious symbols, blessed, then brought home, supposedly for blessing and protection from evil spirits. Holy Thursday includes the washing of the feet of the twelve apostles, a rite that takes place not just in Churches everywhere, but also in the homes of many as a family tradition that continues because of a vow to God or the saints. 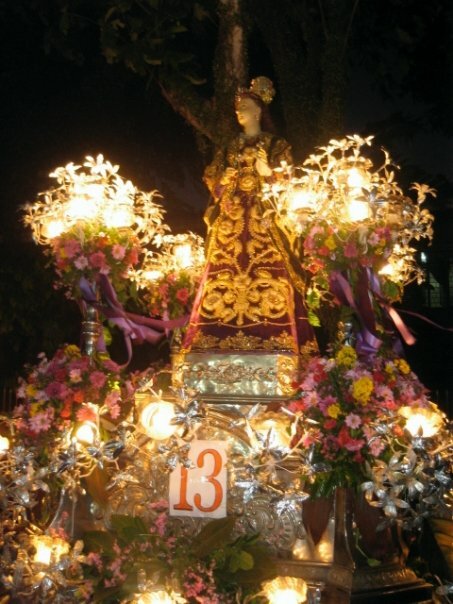 The Maria Magdalena, the Image in the Carosa of the family of Enrica Alunan Lizares. For Protestants, all of this religious frenzy can be very disturbing and pathetic. 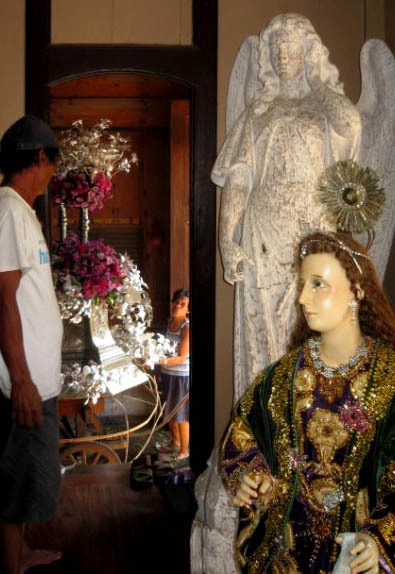 To them, Filipino Catholics appear like ignorant, deeply superstitious lost souls who are digging their pit of damnation ever deeper as they try to save themselves with their penitential rites and their abominable devotion to images. And yet, even among Filipino Protestants, there is a Lenten spirit which is not evident among Protestants in other countries. Here, Protestants have special retreats, special days of fasting and prayer, and special church services in observance of Holy Thursday and Good Friday. There should be no reason for these since Protestantism teaches that Christ has died once for all and our works add nothing to the efficacy of his sacrifice which took place and ended in Calvary. But since Filipino Protestants do have their Lenten practices, we have no choice except to see in them a clearer manifestation of Filipino religious psychology, sans the superstition and the fanaticism that make our Lenten observance a comedia to sophisticated eyes. The San Nicolas de Tolentino Parish Church in Talisay. Notice the Carosas in the background. What do our Lenten practices say about our religious psychology? Despite all of our western style education and all the influence of the west on us, most of us are still very superstitious and as some fundamentalists charge, animistic. In the spirit-sterile modern western world, superstition is almost impossible to appreciate . But spirits are everywhere in the Philippines and one is not necessarily wiser or more sophisticated than others because he has no sense of the spirit world that surrounds him. Are we animistic? While it seems that many of our religious practices are pagan animistic practices that have been Christianized, it bears mentioning that people who criticize our practices as animistic are people who do not use their bodies much when expressing themselves. But expressing ourselves with our bodies and our actions as much as with our words is practically a need for us. So we kiss statues, join the jostling crowds behind the carosas in Holy Week processions, and in extreme cases, flagellate ourselves or have a few nails driven through our hands and feet in re-enactments of the crucifixion. There should be and certainly are more constructive ways of declaring and living our faith. But while faith is best lived out by loving neighbor as self, an objective view should show that our lenten practices are essentially like dance, drama, and ritual which also allow us to express the exuberance of our faith. In our minds, God deserves all of this action and art, no less. There will be other days for loving neighbor and doing good. The fact is that there is much in our faith practices which is reminiscent of Old Testament worship. Think of the numerous obligatory Jewish feasts, the rituals detailed in the Old Testament, the bloody temple sacrifices, the strict food and cleanliness laws which kept the Jews separate and different from their neighbors, the regular times of prayer, the phylacteries they had to wear, the signs they had to post around their door-posts and in their houses. Jewish life was such that almost at every moment, there was some reminder of God and his special relationship to the Jews. Holy Week in the Philippines is meant to have the same effect. Of course the spirit of sacrifice and penance seems to say that we have not made the transition from the old covenant to the new. This is partially true because many, if not most Filipinos believe that God is a god who requires us to work our way to heaven and will send us to hell if our good works don't out-weigh our sins. Ever so often in a year, religious activities that require some sacrifice and penance are therefore helpful for correcting the imbalance somewhat. But is this why we attend processions, church services, etc. during Holy Week? Surely, suffering is such a fact of life for most of our people that we have no need to invent or create suffering for ourselves. Many of us even experience purgatory in this life. The fact is that all of these Lenten activities are occasions for families and friends to come together. 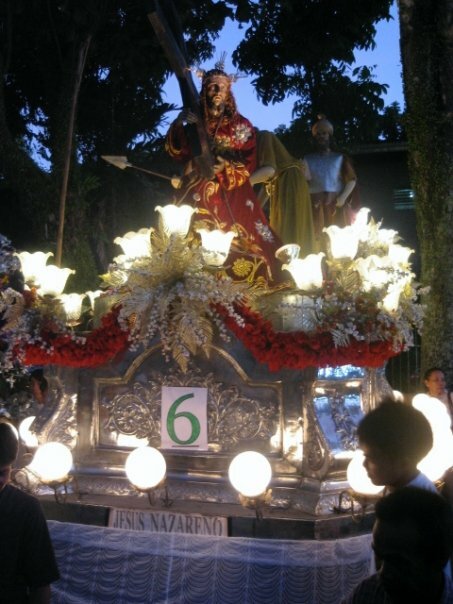 For all the outward displays of repentant piety, Lent is fiesta time in the country. Instead of adding to our suffering, Lent enables us to cope with it, just as getting together with friends, laughing at our problems, and celebrating fiestas helps us to forget our troubles and live for another day. What's even better is that Holy Week always bears with it the promise of Easter, allows us year after year to be participants in a ritual of suffering and death becoming new and glorious life. There is a lot of ignorance and superstition in the way we practice our religion. That is very true. There is a need for more integral faith development in our parishes. Many of us observe ritual obligations but fail to translate Sunday and Holy Week piety into a life of love and service for neighbor. This I think shows that despite the image of God as a punishing tyrant, we also know of God as father, Jesus as Santo Nino, and of course Mary as our all powerful mother and intercessor. Thus, there isn't really much to be worried about because only the really bad and unrepentant people go to hell. Filipino religious psychology still. Life's hard but basically, life's okay. We'll survive somehow and at the end of our days, get to heaven. What's important is that while we live, the family can stay together, and we can have our days of fun and fiesta once in a while. And so the essence of Lent is not, after all, penance and suffering, but fiesta. Or maybe it is all of these in the same way that our people power ousters of Presidents are serious protests against social injustice and revolutions against corrupt rulers at the same time that they are pop festivals and religious feasts. I therefore like thinking that it is not superstition and ignorance which shape our Lenten practices, rather, our Lenten practices are shaped by the same religious psychology that gives us our distinctively peaceful and festive people power revolutions. I am happy with the Filipino version of Lent and of revolutions. Lent as in the west can only mean the demise of the Filipino soul. This article is by Andrea Lizares Si who has a Masters in Divinity and a degree in Law. This Palmas del Mar Website is her way of sharing with the rest of the world, the magnificent heritage that she's been blessed with. 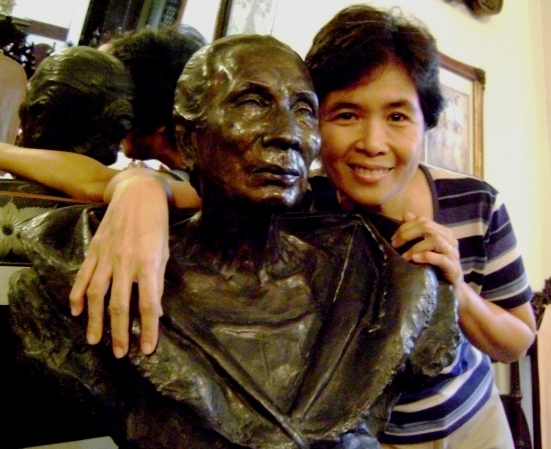 In the picture, the author is posing with her great grandmother, Enrica Alunan Lizares, whose Balay ni Tana Dicang is featured in some of the photographs.